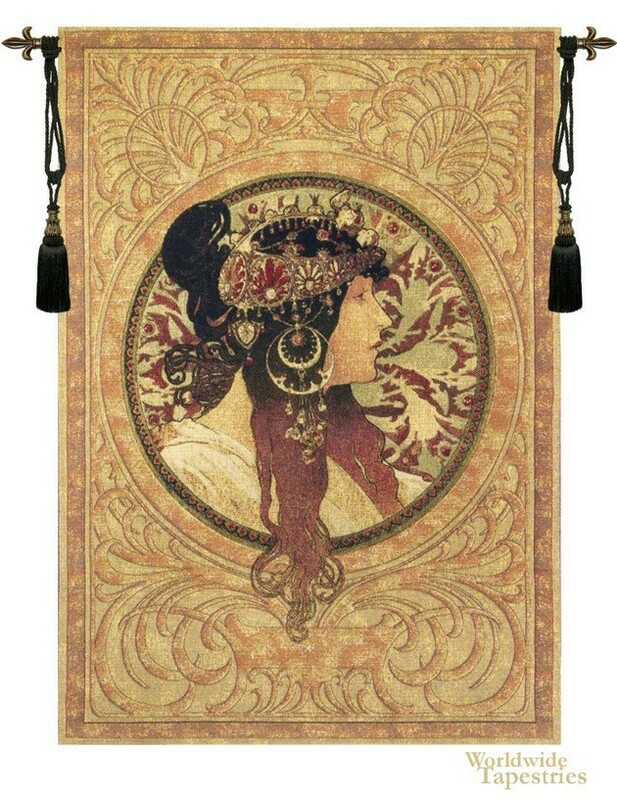 This tapestry 'Moucha' is a homage to the great artist Alphonse Maria Mucha, the creator of many famous works including the four seasons. He was born in what is now the Czech republic, later moving to Paris in 1887 where he produced such a burst of creative work which was initially named the Mucha style, and later was known as Art Nouveau. His works typically involved young women in Neoclassical robes surrounded by flowers and motifs from nature. The work of Mucha has certain similarities to Pre-Raphaelite art but with a slightly modern twist, and frequently used elements of illustration together with pastel colors to bring a new light onto his subjects. This tapestry is unlined and has a tunnel for easy hanging. Note: tapestry rod and tassels, where pictured, are purchased separately. Dimensions: W 36" x H 52"
Dimensions: W 54" x H 72"